Court documents show that California police investigating a violent white nationalist event worked with white supremacists in an effort to identify counter-protesters and sought the prosecution of activists with “anti-racist” beliefs. Via The Guardian: “The records, which also showed officers expressing sympathy with white supremacists and trying to protect a neo-Nazi organizer’s identity, were included in a court briefing from three anti-fascist activists who were charged with felonies after protesting at a Sacramento rally. The defendants were urging a judge to dismiss their case and accused California police and prosecutors of a “cover-up and collusion with the fascists”. 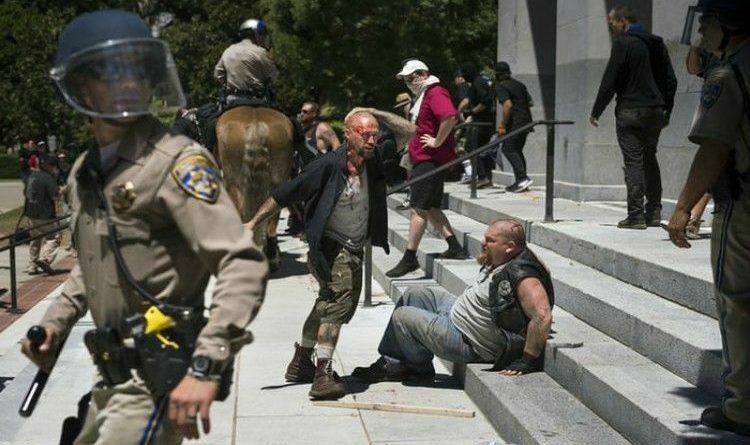 Defense lawyers said the case in the state capital offers the latest example of US law enforcement appearing to align with neo-Nazi and white supremacist groups while targeting anti-fascist activists and Donald Trump protesters after violent clashes. Steve Grippi, chief deputy district attorney prosecuting the case in Sacramento, vehemently denied the claims of bias in an email to the Guardian, alleging that anti-fascist stabbing victims have been uncooperative and noting that his office has filed charges against one member of the Traditionalist Workers Party (TWP), the neo-Nazi group that organized the rally. Some California highway patrol (CHP) investigation records, however, raise questions about the police’s investigative tactics and communication with the TWP. I only know one thing! There’s no one more violent and dodgy than Anti-fa, the fascist ‘sociopathic’ wannabe anti-fascists. They are the one who thrives on violence and hatred, destruction. They are not American’s.